From the window of the rear car, I squinted at the brightness of a departing pulsar. It had had its ticket punched by the dapperly dressed black hole and had laughed coquettishly at what might have been a joke. Something only the brightest light and darkest dark could know. I found myself getting jealous of the tear in space, empty as it was. I asked what he’d said. Thought I’d learn his tricks. I found it easier to accept my place at the edge of the universe. Great work Scribe, you’re really talented and I’m loving your contributions to the prompts! Yet again, you came in a very close second on this one. I love the philosophical bend and humor on this one, it’s a good piece. It just didn’t quite feel like a tight fit to the prompt art, and that allowed the eventual winner to inch a nose ahead of you. Thanks! hat means a lot coming from someone who has been killing the writing game for so long. I won’t quit! You board the midnight train. You know not where it is going, only that you too, must go. The train is brimming to full. You are surprised to find there are no elderly among them. These are youthful bodies, their faces uncreased by wisdom. You look down at yourself and are surprised to see the hands of your youth. No swollen joints, no scars, no pain. No one coughs. No one sneezes. Where you are going, they only take the young and the healthy. The light comes quickly. The journey before was long and hard, but now, you are home. This was lovely imagery and sentiment, Sarah. :-) Thank you for sharing, I enjoyed it! “What’s with the sparks? Are we on fire?” The voice coming from behind spoke panic. I liked this one a lot, A.I. Great genre feel and banter! Nice! Kraden gasped, his hands digging into metal with a death grip, his struggle with the old 73 not coming to an end. He grit his teeth as he heard young screams behind him, and he desperately pulled levers in his engineer cockpit. 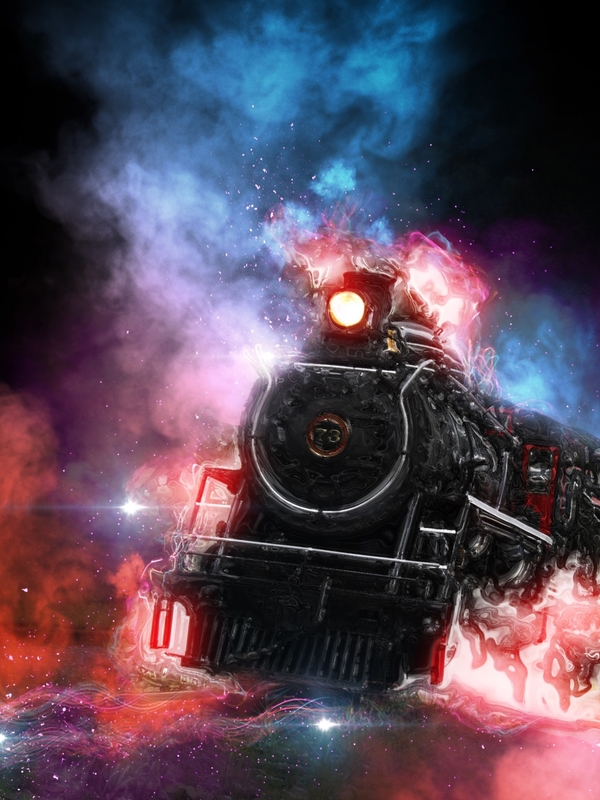 The train thankfully came to a stop in the folds of time and space, red flashes appearing and disappearing in deep black. “Kraden?” a voice said. He turned to his young sister who held a brown teddy bear, obviously terrified. Congratulations, M. A. Scrawl, you’re the winner of the January 30th Aether Prompt! I liked your mix of well-written elements that played to a steampunk, science-fantasy feel without getting too genre-grainy. You setup a cool hook, and the characters sounded authentic and left me wanting to know more. Great work! Your winning entry will get a featured post on Thursday, February 28th, and that also puts you in the running for the WRITER SUPPORT PRIZE PACKAGE being given out in December! Wowsers! Do you have a preferred full name you go by as an author, or a WordPress or other online presence you’d like the post to point to? Congrats on the win! Looking forward to the next duel of the keys! I’d rather you use my name, M. A. Scrawl. And no, I don’t have any other online presence I’d like the post to point to. I do have a facebook page, but my WordPress page is better.